Are your surveys GDPR compliant? The General Data Protection Regulation (GDPR) came into effect in the UK and all EU Member States on May 25, 2018. Any survey that you send in the EU needs to comply with this regulation. 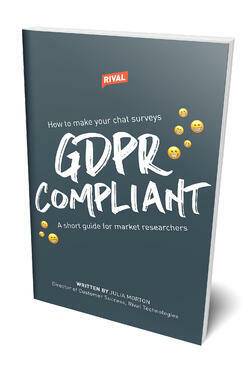 In this short guide, Julia Morton, Director of Customer Success at Rival Technologies, shares six tips for ensuring that your chat surveys adhere to the GDPR.